Last year, the Dorset Waste Partnership (DWP) removed bring banks across Dorset for materials that can now be recycled at the kerbside, such as glass, paper, cans and plastics. Some residents are still taking recyclable items, such as galss, paper, cans and plastics, to locations in and around Dorset where the banks used to be and are leaving them on the ground, which is considered littering or fly-tipping. Some people even place items in the wrong banks, causing materials to be spoiled. This is especially true of glass, as bottles or jars thrown in with non-glass items can ruin entire banks of recyclable material. As a result, some services are now at risk of removal because they are becoming too costly to provide. This includes bring banks for carton recycling. Cartons, such as those made by Tetra Pak, Elopak and SIG Combibloc, are typically used for food and drink packaging, such as juices, soup, milk and sauces. They are made from fibre, plastic and aluminium foil, so are recycled separately to cardboard and paper. While they shouldn’t be mixed with other recycling at the kerbside, these waste cartons can be flattened and taken to a carton bank. Once collected, they’ll be taken to a facility in Halifax and broken down so they can be recycled into a variety of products, from cardboard tubes to garden furniture. Parley councillor Barbara Manuel and a member of the DWP’s Joint Committee, said, “We know most of these residents are trying to do the right thing by taking their glass, paper, cardboard, cans and plastics to the car-parks where the remaining bring banks are, but this is now incorrect and completely unnecessary.” She appealed to householders not to put incorrect items in the banks or leave them on the ground. 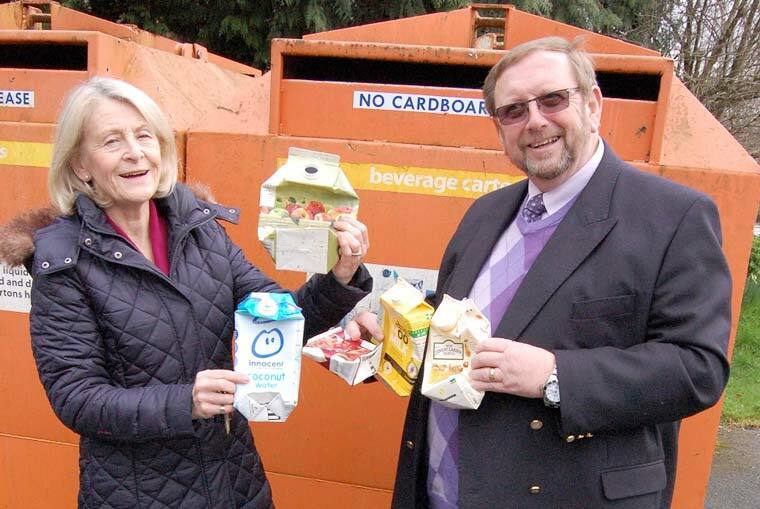 And Ray Bryan, district councillor for St Leonards and also a member of the DWP’s Joint Committee, said, “It would be such a shame to lose the carton recycling service in Dorset just because a few well-meaning individuals are unaware they are using the bring banks incorrectly. I think many people falsely believe these items are sorted by hand, when in reality we are completely reliant on residents putting the right things in the right banks.